Last week I gave a few tips on self-love. This week I want to begin by making some facts clear. Everything that is suggested in any of my writings is optional. You must do as your heart tells you. You are not following instructions or following me. You are a leader and you choose what you do with your life. No one else. I am only writing to remind you all of something you might have forgotten. As you advance in the course, you will realise that nothing of what you are going to read is anything of another world and that you already knew this, although to really know something we must go through the experience and feel it. Learning self-love is only a matter of remembering by giving baby steps towards a better way of treating yourself. It is not only that we take life and others for granted, but we also take ourselves for granted. Deep inside we all know that life on this planet is temporary and that we are going to be reaching a different state afterwards even if you don't yet recognise it. This sense of immortality that somehow we live by should not stop any of us from having a better life or from loving ourselves, as well as others. What we do here and now is what really matters. I would also like to make special emphasis on an important fact. The suggestions I make here are not exercises, but practices. The word exercise implies that we have to do something, as well as hard work. It should never be hard work. A practice on the other hand is something we do regularly, a habit that we adopt and which eventually becomes part of our daily routine and a way of living. Understanding this is extremely important. There is nothing you have to do or don't do. In a few weeks and as you begin to see a difference in the way you treat yourself and how others are treating you, you will also find your own ways to self-love. While I know that these tips practised regularly make a difference, I also know that flexibility, creativity and imagination play a crucial role in personal transformation. If at any point you feel that you must introduce a new element to your life, do so. Anything that can improve your life must be integrated. 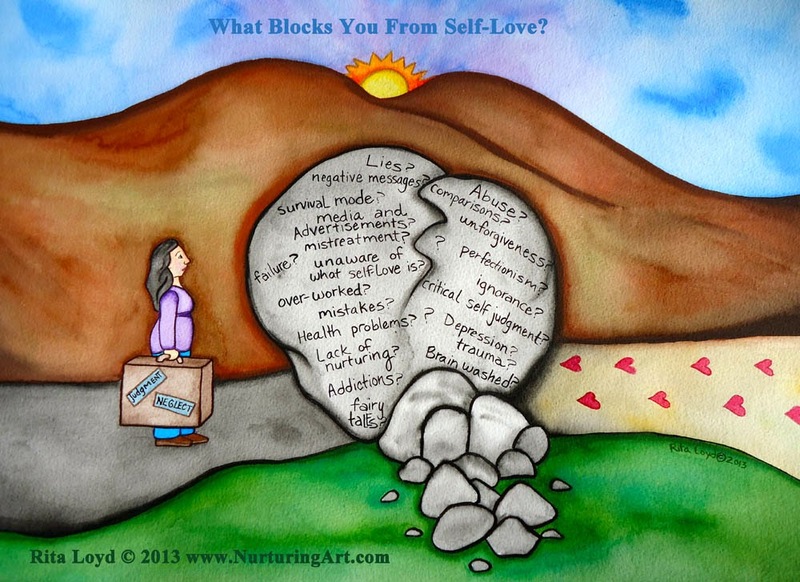 I believe that many readers must have set a time frame to return to self-love. Please do not be anchored by time. There is no rush and there's no time limit. It will come at the right moment. Everything can change in a second. It's as easy as that when we believe. And now a few more tips. Say No: Everyone has things to do that we cannot avoid. Whether this is in the professional or domestic environment we must continue doing them the best we can. However, everyone is also surrounded by forces which are very draining and demanding. In the majority of cases this would be people who expect from us more than they should. It is time we begin to say no to these demands. You must decide which one of these activities or requests are draining you from your vital energy. This could come in very subtle and not so subtle ways. Too often people try to make us feel guilty so as to force us to do something for them. When we do not, we are called lazy, selfish or any other term they can think of to get a reaction of compliance from us. In the end, we are not only doing what they want, but we also accept and agree that if we do not serve others we are lazy, selfish or anything else they want us to be. When this happens, we are defined by others. Saying no is a healthy way to begin to redefine yourself. Say no to all demands that are not healthy for you. You already know what they are. Saying no is one of the most difficult things to do for a person. Be strong, say no and stick to it. If you feel guilty in any way, stay with the feeling and do nothing. Eventually the feeling will disappear and you will feel stronger. Once you say no to something or to someone, write it down and see how you feel. Stay with the feeling. Be Selfish: Being selfish is not a bad thing when is done right. The idea that being selfish is a negative trait comes from the deeply ingrained belief of guilt in the human psyche. There are however healthy ways of being selfish. Do not cause harm to anyone. You must differentiate between harming someone because they're trying to make you feel guilty and harming someone deliberately with your actions. It is a fact that people feel offended too easily, too often. In most cases this is not a feeling, but an automatic tool to manipulate others. If our actions meet with projected guilt, this is not causing harm, but self-preservation. It is time and it is long due that people around you learn that they are trying to make you feel guilty. Say so if you must, as this kind of behaviour is a clear example of being selfish in a very unhealthy fashion. It is also important that you do not take anything from anyone unless they can give it away freely and/or they do not need it. The ideal situation is to give something in exchange when we receive, but if you are at a stage in which you cannot offer anything back, do not feel obliged to do so. Be honest with the other person and let them know you cannot return the favour right now and that you might never be able to do so. You might be able to do so in the future, but do not create a moral debt that you cannot repay, as this will only lead to a sense of guilt once again. Do not feel guilty or refuse to accept something from someone who does not want anything in return.Trust. Many people give freely, as they understand the importance and the effect than giving has individually and collectively and they are in a position to do so. Do what is best for you and if possible do it alone. By doing things alone you are taking responsibility and you will gain a sense of accomplishment and resourcefulness you might have not experienced before. Again, write it down and see how you feel. It's important that when you experience a new feeling you stay with it. Go Out: This is a date with yourself. Take time to be alone and go out alone. Treat yourself to something you enjoy. Whether this is to have a coffee alone, a meal, go to the cinema, the beach or simply go out for a walk, make sure you take time for yourself. In learning self-love is crucial that you learn to be alone not relying on the presence of others to make you feel whole. Make it an interesting experience, use your creativity and imagination and be flexible with it. Maybe this is the time to treat yourself to something you've wanted to do for a long time, but you never found the time to do. Treating yourself is an important part of self-love. You deserve it. Perhaps you will end meeting someone special during your outing, but do not make this your purpose. If you are in a relationship let the other person know why you are doing this. Once this is done, congratulate yourself and make it part of your routine, if not every week, once a month. More next Thursday. If you missed week one. This is the link for it. And see you here next week.